Did The High Priest Have A Rope Tied Around Him When Entering The Holy of Holies? 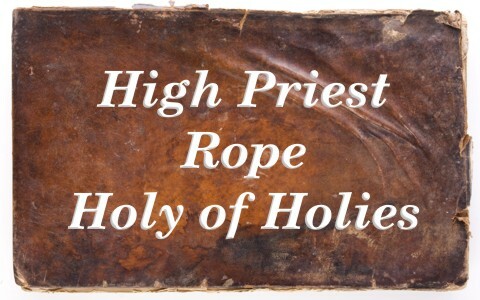 Is it true that the high priest had a rope tied around his waist when he entered the Holy of Holies? The Holy of Holies represents the very presence of God and is a dangerous place to make a mistake or do something without thinking. The high priest could be struck dead if they did something they were commanded to not do and if they were commanded to do something and didn’t do it. There is no grey area about serving as a high priest. You had to get it right or you’d be dead. That’s just how serious God takes being in His presence, for nothing unclean can be near Him as He is pure holiness, perfection and without blemish, just as Jesus Christ is described. The Book of Leviticus is about the priestly duties and strict requirements and this may explain why the Book of Leviticus has more references to holiness (80 times) than any other book in the Bible. That’s because God is highly concerned with His holiness and how we regard Him in a reverential way. He doesn’t take that lightly. The high priest could only go into the Holy of Holies once a year and that was only on the Day of Atonement (Yom Kippur), representing our sins being placed upon Christ, represented by placing the hands on the goat along with all of the sins of the people. It was called the scapegoat and upon his head were symbolically placed all of the sins of the people. After this, he is sent into the wilderness, never having done anything deserving of death. The high priest’s clothing had dozens of different accouterments with specific meanings attached to each one. For example, bells were part of the priest’s attire and may have represented praise to God, since the Hebrew word for bells sounds very much like “strike” or “to strike,” otherwise we are not told what the bells represent, only that “the sound of the bells will be heard when he enters the Holy Place before the Lord and when he comes out, so that he will not die.” (Ex 28:35). No bells, means no life for the priest. That’s because every single piece that the high priest wore represented something that God was trying to teach the Israelites about himself. Aaron or the many priests that would follow knew that “it shall be upon Aaron when he ministers, and its sound will be heard when he goes into the holy place before the LORD and when he comes out, that he may not die” (Ex 28:35). By following all of the strict dress requirements, Aaron was committing himself to holiness, and if all was worn exactly as was required, Aaron could be assured that he qualified for divine service and would be accepted by God as a mediator between God and the people of Israel. Ropes around the High Priests? We have already read about some of the requirements of the high priestly clothing, but there is Jewish tradition that holds to the belief that the bells were tied to the priests tassels so that if they stopped hearing the bells ring, they would know that the high priest had made a mistake and God had killed him, so there is some Jewish tradition that holds that the bells were there for those who remained outside of the tabernacle of God to hear or not hear. When they heard bells stop ringing, they assumed that the high priest must have done something wrong in the Holy of Holies and God must have ended his life, so, and again, according to Jewish tradition, the priest had a rope tied around his waist, and when the bells stopped ringing for a time, they could at least drag out the dead body from behind the curtain and the Holy of Holies. The only problem with this is that the Bible never says anything about a rope. The nearest thing to a rope in the priestly attire was a sash, but this was used to go around his waist, so with the dozens of items that the high priest had to wear, nothing is said in Scripture about there being a rope or having a rope tied around the high priests waist. This Jewish tradition cannot be supported by Scripture. All it says is that “the sound of the bells will be heard when he enters the Holy Place before the Lord and when he comes out, so that he will not die.” (Ex 28:35), and the same death sentence is pronounced for every other detail in the high priest’s clothing. The Jewish tradition that the high priest had a rope tied around him may have come long after the temple was destroyed but we have been unable to locate the original source of that belief. I was only able to find one, single historical reference about a rope being tied around the high priest, and that comes from the 13th century Jew, Zohar, who wrote the Jews required a cord or thong to be bound to the feet of the high-priest so on the chance that he went into the holy of holies and died there, they might be able to drag him back out. Zohar believe this because it wasn’t lawful for another priest to go in, especially not being a high priest which was required on the Day of Atonement. If this is true, it still doesn’t mean that it was part of God’s original requirements given to the priesthood. It only means it could have happened well after the Bible was already completed, so this is clearly a Jewish tradition and not a law of God. There is not one shred of evidence in the Old and New Testament, in the Apocrypha, or any of the Dead Sea Scrolls, Josephus’s writings, the Pseudepigrapha, the Talmud, the Mishna, or any other authoritative source that states the high priest had to have a rope tied around his leg, his feet, or his waist. Just be glad that Jesus is our high priest and has entered into the Holy of Holies once-and-for-all, with His own blood, and did for us all, what no human high priest could ever do. Otherwise, we’d all be at the end of our rope. Related reading: Did Jesus Fulfill the Day of Atonement? I could go on because there are many problems with the Talmud so the “rope” issue is the least of our worries when reading the Talmud. This is all so contrary to Jesus’ teaching that it’s just the opposite in many cases, therefore the Talmud cannot be used to measure true, biblical truth. Selam Abiti, how is everything going? Would you please pass this article to your dad? Previous post: Do You Know Your Role in the Kingdom of God? Next post: What Did The High Priest Do On The Day Of Atonement?